First stop after leaving Townsville was the surprisingly short 2 hour drive to Charters Towers. For some reason I imagined the famous Charters to be miles inland and in the middle of nowhere. Neither Chris or myself have been on the Townsville to the Three Ways (NT) road before, so this was all unchartered waters for us all. 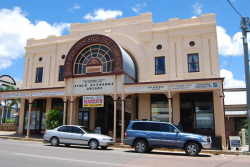 Charters Towers certainly had an 'Old World' charm about it. Chris and her love of architecture(!!!!) had the camera snapping away for what seemed an eternity. We did a walk around the main town area and visited the local bakery for a couple of after lunch treats. A lot of these smaller towns have great museums, with all sorts of things from yesteryear on display. These were harsh days for the pioneers and it was interesting to see how tough it really was. It certainly makes the kids realise that being asked to do the dishes every so often is not so bad after all. We found a beautiful park in the middle of town for our lunch break that very much reminded us of Toowoomba. The only down side was that we had to share the park with a few million bats and therefore it did have a bit of an odour to it. Next stop for an overnighter was Hughenden. The town has a nice council caravan park with a 33 metre pool. You beauty. It was as hot as hades, so it was a lovely way to end a long hot day. Next morning we packed up early and visited the local dinosaur museum. Ladies and gentleman, this is 'Dinosaur Country' and everything for the next 200kms revolves around these prehistoric monsters. 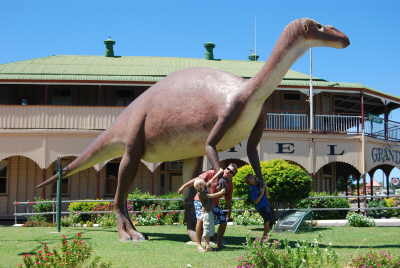 There is a full size replica of a 'Muttaburra Dinosaur' in the main street, and even the garbage bins have a prehistoric theme. The museum was a great introduction to the area and we spent a good few hours looking at all matter of things that roamed this area over 100 million years ago. Once again I am not so sure about the old saying 'the good old days'. Many of these guys were very nasty and extremely vicious. When they were having a bad day, nothing was spared. I am not sure how the boys got on, but I had real trouble getting my head around the 100 million years ago thing, the fact that there were no people, and that what is now inland was once the bottom of the ocean. Its in the same league as space and the fact that it goes on forever. I have trouble with that concept as well!! Next stop and not far down the road was another dinosaur town, Richmond. What a great little place. In 2001 the local council decided to dig a huge lake in the middle of town and fill it with fresh water from the local river, and named it Lake Fred Tritton. 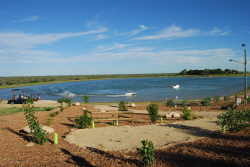 It is big enough to water ski on, swim in, jet ski or sail on. Around the lake is a cement jogging/walking track, barbeques and shelter sheds. There is even a small water park to keep the little people amused. And just to impress a little more, it is flood lit at night, and looks amazing. The local council caravan park is perched on one side of the lake and made a sensational backdrop in an otherwise brown canvas. Richmond also has a dinosaur museum, which is a little more upmarket than Hughenden. It has a self guided audio commentary with a device that you simply held to your ear. It gave enormous detail, on everything big and small. Harry in particular thought this was pretty cool and stood and listened to everything, some even twice. After the museum it was a 15km drive to a council quarry to fossick for, you guessed it, dinosaur remains. It was hot, dry and very dusty, with young Harry making the find of the day. We have no idea what it is but it looks like either a claw or very large tooth encased in rock. Regardless it is impressive and no doubt very old. To think that it might have once been attached to a prehistoric creature again has my head spinning. Other than that we only found a few small items (pieces of belemnite - an ancient sea creature) to help weigh the camper down even more. There was a very noticeable change in the colour of the country from this point on. From Townsville to Richmond, the countryside was green and lush after all the rain. It really was a beautiful sight and not one you see every year. From Richmond on, the countryside just got browner and browner, and dustier and dustier. The change was significant and dramatic, which is what makes Australia such a fascinating place to explore. Next stop was Mt Isa where we planned to stay a few nights. Now I am not exactly sure what I expected of the Isa, with my mental image being nothing like the real thing. This place is fairly large and is very remote, being only 200 kms from the Northern Territory border and nearly 900 kms to the East Coast. The first thing to take your eye is the mine that is smack bang in the middle of the town. Why you would put the town almost in the mine is a little hard to understand, but there you are. 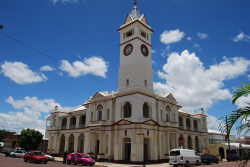 Town is surrounded by a large mountain range that does give a lovely backdrop to an otherwise unattractive town. In saying that, and not wishing to be harsh, it does have a wild west, tough guy feel to it. We did the rounds of the local caravan parks, none of which are particularly inviting, and stayed in the 'Copper City Caravan Park'. We set up down the back of the park on a lovely grassed, shady area opposite a very well equipped camp kitchen. All the caravan parks in town are filled with permanents, employed at one of the mines, as any other accommodation is impossible to find or prohibitively expensive. Our first stop in the morning was at the Isa's 'School of the Air'. We had a very informative teacher show us around, and being the only people on tour, it was very customised to our interests. The old HF radios are no longer used, with normal telephones taking their place. There are huge advantages in using telephones, with the main two being that numerous people can talk at once (although they teach phone etiquette!) and the improved quality of the call. In the old HF days once the button was pushed nobody else could talk. The problem being that when the teacher asked little Jonny how his weekend was, Jonny would push the button and then spend the next 20 minutes telling in great detail everthing he did. The teacher was unable to interrupt and nobody else could say a thing. The new system is computer operated and very hi tech. We had not been in the building 10 minutes when a teacher walks past and says to me, "I know you!" Michelle Ridge was a teacher at Kepnock about 3 years ago and has been at the Isa since. She loves it so much she said she would be there until she dies. I don't wish to sound unfair but these guys really do have it made. They do one 30 minute phone lesson a day, have no playground duty, no bus duty and no discipline problems. The rest of the day is spent marking work that is sent in, with very little preparation as it is all prepared by somebody else, made into booklets and posted to the students in term lots. Both School of the Air and School of Distance Education all use the same standard packages, thus preparation is practically nil, or very close to it. Then every few months they jump in a chartered plane or the Landcruiser and visit some kids on their properties or go on a school camp. I guess the down side is you have to live somewhere rather remote. Our next visit was to the 'Underground Hospital' which is in the current hospital grounds. During WWII they believed that Mt Isa could be attacked by the Japanese. 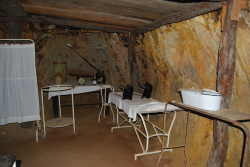 In preparation for that possibility, the local miners were asked to build an underground hospital, for no pay and on their days off. They did and completed it within a very short time frame. As we know the attack never happened and this fully stocked hospital, that had a small operating theatre, maternity section, kids and general ward was never used. In fact the entry became overgrown and people forgot it even existed. It was rediscovered again not so long ago when a backhoe doing some work, literally fell into one of the wings of the hospital. It has now been taken over by a group of volunteers and is now heritage listed. It was very interesting with a very well stocked museum in a building above, housing all types of old medical equipment and instruments. While we were underground it started to rain, which got heavier and heavier. Next thing water started flowing into the tunnels at a great rate. The water around our feet got deeper and deeper. As the rain did not appear to be easing we decided to do a runner to the museum above. As we left the tunnel we realised this was not just heavy rain, but also destructive winds. There were trees down across the paths and stuff everywhere. The lady in the museum said she thought the building was going to blow away. All we could think about was the camper. We got in the car and on the way back to the caravan park the damage was amazing. Sheds blown away, roof's damaged and trees down everywhere. The local radio station was calling it a mini tornado. We braced ourselves for what the camper was going to be like. When we got to the park, it was obvious they had coped it as well. More trees down, annexes destroyed and there was the camper, sitting there in all its glory, unscathed. In fact there were a few people standing there looking at it, wondering how in hell it had survived, with so much damage all around. 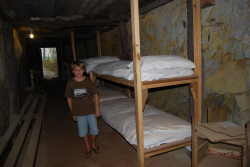 Had I not left a few windows open, that did saturate the boys beds, we would have been fine. Not a bad test for the 'The Trailer Shop Camper', let me tell you. Now on the subject of the camper, let me tell you what we think thus far. This thing does not have the comfort of a caravan, and is in fact nothing more than a tent on a trailer, but it can go places the caravan can't. Our set up time is amazing, with the basic set up taking around 15-20 minutes, with very little effort. That gives you sleeping accommodation and an open air kitchen. Pull down takes just slightly longer. As far as sleeping goes it is great. It has heaps of big windows and our expensive 12 volt fans have been our saviour. The boys are very happy on the camp stretchers. Now you must remember it is early February, bloody hot (very high 30's to low 40's) and we have never slept so well. A queen size bed with enough head room to actually stand up,and the fact that we are all together, and not crawling from one tent to another is luxury. With all the windows open and the fans on we have been pulling up the sheets and doonas at night. These fans cost around $100.00 each, are 2 speed, almost silent and draw around .4 amp. They are the best of the best, and no camper trailer should be without them. The plastic crates that Chris bought to pack inside the trailer (from Bunnings) are great with everything having it's place. The trailer tows really well and so far, we would not change a thing. We are very happy with our choice and are living very comfortably (see cover page for contact details if you are after a great camper). The 'Beast' as we have named it certainly does get a few looks and comments. She certainly is a head turner. Anway, back to the travel. We left the Isa, traveled through Camooweal and crossed the border into the NT. This is a very boring border crossing with nothing but a scaby old sign covered in graffiti. Next stop was Barkley Homestead Roadhouse. Now this was a place where I really wanted to stay. No particular reason except it is a place that you often hear people talking about. I had an impression of an old homestead with green grass and shady campsites scattered around. What we were confronted with was a dirty old rundown dust bowl with overgrown weeds as far as the eye could see. This place severely is in need of some TLC. Couple that with the most disgusting, filthy and dilapidated toilet block in the world and you have Barkly Homestead. As for the homestead itself, it was nowhere to be seen. Then to add insult to injury, they charge like wounded bulls. I don't want to go on here, but I forgot to mention the pool. It gets cleaned as often as the weeds get mowed. Regardless we had a swim anyway, as the pool was marginally cleaner than the toilet block, and I spent the whole time being attacked by some very fast aquatic animal that really packed a punch when they bit, and bite they did! Take our advice. If travelling this way go the extra 100kms and stay at the 3 Ways Roadhouse. Talk about chalk and cheese. This actually does have lovely, well mowed green grass, clean toilet block and a well maintained pool with as far as I could see, no resident wildlife. All this for the same price as Barkly. Not happy Jan. We will know next time. Next stop was one of our favourite places in the NT, Daly Waters Pub. We stayed there in September on our last trip around the block, and nothing was going to stop us visiting again. It was much quieter than last visit with only one other camper trailer and a whiz banger (they are those horrid vans with sliding doors). We had dinner and a few drinks in the pub and looked for items left by friends traveling through at the same time as we did in 2006. Unfortunately they had recently painted the inside and a lot of the stuff (I am not sure there is another word to use here) had been removed, in waiting for new stuff to be left. Both Wayne and Tracey's and Tim and Katie's memorabilia was no longer, but we did leave a bit of ours this time. Although very quiet, we had a good meal and a great time, chatting to the staff and the other campers. This is a very special place and so 'bloody Australian'. Next day was Daly Waters to Katherine. There is a fair bit to see if you are passing through this way, so take your time and enjoy what there is to see. Next trip we will most definitely be stopping at the Larrimah Pub, which I believe is almost as well known as the Daly Waters Pub. It boasts having 'the highest bar in the Northern Territory'. Now I am not sure if the actual bar is high or if its the elevation of the ground that the building is on. I will find out next time. It was a bit too early this time to stop for a drink. Next stop was Mataranka (covered in more detail in September 2006) where we stopped for a quick swim. We only visited the main swimming hole at 'The Homestead' and for most of the time we were the only ones there. That was a pleasant change from our last visit when it was almost standing room only. While this is clearly not tourist season, due to both the wet and the heat, the upside is you have most places to yourself. The down side being that a lot of attractions are not operating. Mataranka was just recovering from a very nasty flood that again threatened to fully submerse the caravan park and surrounding area. The swimming hole had only just been reopened having had a couple of metres of water over it. We then drove 20kms out of town to the graves of identities from Jeanie Gunn's novel, 'We of the Never Never', and numerous others from the late 1800's, most of whom worked on the station at that time. It was very interesting walking around reading the stories of hardship and often misery that are so often quoted as the 'good old days'. The day's traveling then continued to Katherine for an overnighter before the final day's drive to Darwin. We arrived at the 'Low Level Caravan Park' Katherine (a Big 4, that charges BIG dollars as they all do) and as we pulled up at our site the heavens opened and down it came. We all sat in the car, the boys watching a DVD, while Chris and I read. Finally it stopped and we set up on very soggy grass. There lies one significant benefit of a caravan. We arrived around lunch time, with plenty of time to find a caravan park and set up. We had planned to stay at the Malak Caravan Park as we did last time. So in I went to book in. When I told the lady I wanted a site, she looked at me, looked at the camper trailer, and then looked at me again. She asked if I had heard the weather forcast. On answering 'no', she informed me that monsoonal rains were predicted for the next week. She said "Are you sure you want to camp in THAT during monsoonal rains?" I answered, "I don't know, do I??" Her response was quick and with much certainity, "No, you don't!" she replied. Great, now what do we do?? Out came the phone book and we found a nice holiday apartment in the city for 3 nights. That would give us time to sort a few things out. The remainder of the day was beautiful and sunny and I started to think we had made a mistake, and should have set up the camper. I was wrong, and she was right. By that evening down it came. And boy was it heavy, and it went on for day after day. Large areas of Darwin were flooded and it would have been absolutely miserable had it not been for that very honest lady. For the next 5 nights the Health Dept paid for our accommodation as they were unable to get us on a flight out of Darwin. 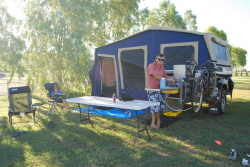 We shifted into a large two bedroom cabin in a very nice caravan park about 10 kms out of the city. It was a good move as the kids had more room to run around. We ended up spending just on a week in Darwin and what a busy week it was. The road to Wadeye, the community that we are going to is impassable for over 6 months of the year. The Daly River is the main obstacle having around 14 metres of water over the road at present. So this presented us with a few issues. The first was what do we do with the car and camper. The road will possibly not open until June and some years it can be later depending on how long the wet goes. Being cyclone and wet season we wanted car and camper not only secured but also undercover. So the search began. We ended up getting a 12x 3 metre lockup storage shed opposite the caravan park we were staying at. At $345.00 a month it is not cheap (luckily work will pay for it until the road opens) but it is nice to know that it is safe and dry. Our next issue was getting our gear to Wadeye. At present the only way to get there is to fly. That allows you 20 kg per person freight. The barge which delivers all the other gear to the community only goes out once a fortnight and it would arrive in Wadeye nearly two weeks after we arrived there. That meant we had to split all our gear into 1/ have to take and 2/ gear that we could wait the 2 weeks for. So the must take gear included clothes, a few personal effects and food. All the gear for the barge was sorted and packed into all the boxes that were on the roof of the car, and a few packing boxes we bought. All sounds easy but it was a massive job. We then had to open up an account at the barge company and an account at Coles. We have to order all our groceries via a list faxed to Coles. Somebody then runs around the shop collecting all your groceries, packs them in boxes and takes them to the barge. All that is done for just $22.00 which I think is a bargain. When you consider how many people in the NT live in remote and inaccessible places, these stores that offer this service must be incredibly busy. All the food is packaged into dry, chilled and frozen foods and once unloaded from the barge in Wadeye it can be collected from the back of the local store. I also had to attend computer training and a couple of meetings while in Darwin in preparation for the new job, while Chris was busy stocking up on necessities to be packed for the barge. So our week was anything but leisurely. Finally the big day arrived. The day we were going to fly to our new home for 6 months. All the time and effort we had put in to get us to this stage. All the phone calls, emails, planning and all those 'are we doing the right thing' moments. Now was the moment of truth .We were all excited and a little apprehensive about what lay ahead. At 6.30am the limousine (true story, thanks NT Health) arrived at the caravan park and off to the airport we went. Our plane was a 12 seater which only carries 8 passengers as they take out some seats to fit in the freight. Chris was not at all happy that it wasn't a 747, while I was happy it had 2 engines. Finally we boarded and took off on the most beautiful clear morning we had seen all week. I thought to myself 'what a great day for a flight'. The trip takes 50 minutes and fifteen minutes into the trip the sky got darker and darker, very bouncy and rough, with lightning all around us. Then the rain started and the sound of the rain lashing the windscreen of the plane was horrendous.The look on Chris's face was priceless with the boys loving the roller coaster ride. We arrived somewhere over Wadeye and flew around for at least 20 minutes waiting for a break in the weather so we could land. By this stage poor Chris was almost panic stricken, not to mention the gouges her fingernails put in my legs!! Finally the pilot turned around and said we had two options. He could keep flying around and run out of fuel or head back to Darwin. The choice was clear, so back to Darwin we went.Unfortunately for Chris the trip back was equally as unpleasant. My biggest issue now was that I had to get Chris back on the plane again somehow!!!!! We landed safely and then spent the next 3 hours sitting in this old building, miles from the main terminal with nothing but an 'out of order' drink machine. As we had expected to be in our new home by 9.30am, we had taken very little food to snack on. By lunch time we were not only sick of waiting, but also getting very hungry. Luckily somebody from the airline offered to drive Chris and another lady to buy some food. So now we were not hungry, but still waiting. By about 2.00pm we were starting to wonder if today was going to be the day. By now the weather in Darwin had again turned nasty with the afternoon storm clouds rolling in. On our flight was the local butcher who rang his boss in Wadeye, and was informed that the skies were clearing. The butcher went in and told the airline staff, and within minutes we were back on the plane again and back in the sky (things happen in strange ways up here). This trip was the exact opposite to the first. The first half was rough and cloudy with the second half of the trip clear and sunny. It finally looked like we were going to get there. The view on the way there was amazing. We could not get over the amount of flood waters that engulfed all the land, as far as the eye could see. 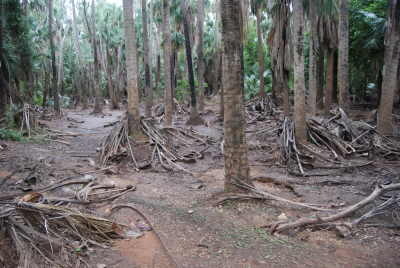 This truly was wet lands at their best, with huge rivers meandering across the floodplains like huge slithering snakes. Welcome to the Top End. Finally we were back on the ground again and taxiing towards the terminal. Ha! Ha! Ok, the shed. What happened next and what were our first impressions?? Sorry. You will have to wait until next month. Stay tuned. A ship in the harbor is safe, but that’s not what ships are built for. The same goes for life.